Thank you, TV Guide. Finding television video clips on the Internet just got a whole lot easier. 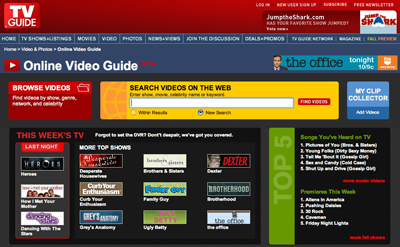 TV Guide, famous for its listings of the week’s television shows in print and on the Web, officially launched its online video guide this week at video.tvguide.com after being in beta since April. Its lofty goal is to filter out the junk and clutter and give television lovers the best Internet video as it relates to favorite TV shows. “We’re filling a niche that Google and YouTube are not because they are not strictly TV-focused,” said Paul Greenberg, TV Guide Online General Manager. Greenberg says that as many as 70 percent of YouTube users are seeking professional content, not user-generated, when it comes to their TV shows. Searching on programs such as “24”, “The Office,” or “Heroes” at Google, Yahoo!, or other search engines leads to a mishmash of genuine clips, network links, news reports, user-generated content, advertising, and so on. With TV Guide Online, users will be directed first to free episodes and then to all other professionally produced content as it relates to the shows. There are other online solutions for finding Internet video as it relates to television — Daily Reel, WeShow, LocateTV, even buddy.tv and Sling Media are getting into the action. But none of those sites have the history, clout, or resources of TV Guide. TV Guide Online is nicely organized and presented. Prominently displayed, of course, is a search for shows on the Web. Even handier is a section called This Week’s TV, which graphically lists shows of interest aired last night and other top shows of note. Another nice touch is a section dedicated to Songs You’ve Heard on TV. Also included on the site are Music Videos, Late Night, and Sneak Peek at upcoming shows. There’s also a Shop to buy videos, with links to Amazon’s Unbox or Apple’s iTunes. Completing TV Guide Online’s offering is Cool Viral Clips. When you click on a show, “Heroes” for example, you are given a page of the show’s clips. Click to watch a video, and you are taken to that network’s site — in this case NBC — where the clip plays in the player native to that site. TV Guide Online also gives you a link for more information, the opportunity to email clips to friends, and the ability to add the video to My Collector. My Collector is nice because you can add clips that you want to watch, then play them in succession rather than watching one at a time. All of the clips are available for free and on-demand, but that doesn’t mean they are advertising free. All of the video clips sampled had some sort of commercial attached — either at the beginning or during playback. TV Guide, which had 4.9 million unique visitors to its site last month, receives no money from the traffic it generates to network sites. TV Guide, however, sells more for its site. “Part of the way we are marketing this is, ‘Oh, you forgot to set your TiVo? Here’s the show you missed for free,’” Greenberg said. Hi, I’m from the team at LocateTV and would like to point out that we do something a little different to TV Guide Online. LocateTV lets you search for where and when an actor, programme or film is on TV, online or DVD (not just the net), specific to your region – UK as well as US. The focus is on professional content rather than web clips or virals and we’ve purposefully steered away from the gossip/poll model to keep it very clean and Google-like. Our aim is to point you to wherever you want to get a piece of content, not host it, and provide embeds for people to share this dynamically updated information on their MySpace pages, blogs, forums etc – let them be their own listings hub! We do plan other features when launched (we’ve just gone into public beta) such as customisable pages, RSS feeds etc but at the moment we’re keeping it as clean as possible. Be good to hear if people think this is fulfilling a different purpose to the TV Guide model, especially in relation to the embeds – and if they think we’re going in the right direction by keepnig it ‘Google-like’ rather than the branded, do-everything ‘clout’ of something like TV Guide. Huzzah for TV Guide – they’re always ahead of their game.